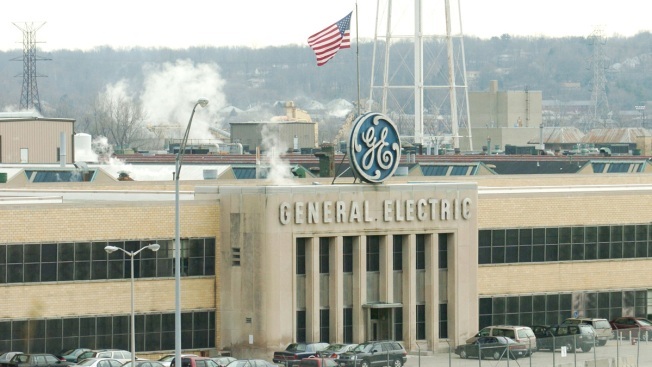 This Dec. 8, 2003, file photo, shows an exterior view of the General Electric Jet Engine Plant in Cincinnati, Ohio. General Electric will be dropped from the Dow Jones industrial average next week, ending the conglomerate's more than 100-year run in the 30-company blue chip index. The company's woes have hammered its stock in recent years. The stock-price slide is a key factor in GE's exit from the Dow, which is calculated using the prices of 30 large, or "blue chip" stocks from various U.S. industries. Walgreens Boots Alliance's share price is higher, and it will contribute more meaningfully to the index. "Today's change to the DJIA will make the index a better measure of the economy and the stock market," said David Blitzer, managing director and chairman of the index committee at S&P Dow Jones Indices. Tuesday's announcement added to GE's stock woes. It came after the close of trading on Wall Street, but in after-market dealings, GE's shares fell 1.4 percent. Those of Deerfield, Illinois-based Walgreens Boots Alliance Inc., meanwhile, jumped 3.2 percent.